Prick skin of sweet potato with fork. Microwave on High 6 to 8 minutes or until tender. Let cool 15 minutes or until cool enough to handle. Peel and cut up cooked sweet potato. 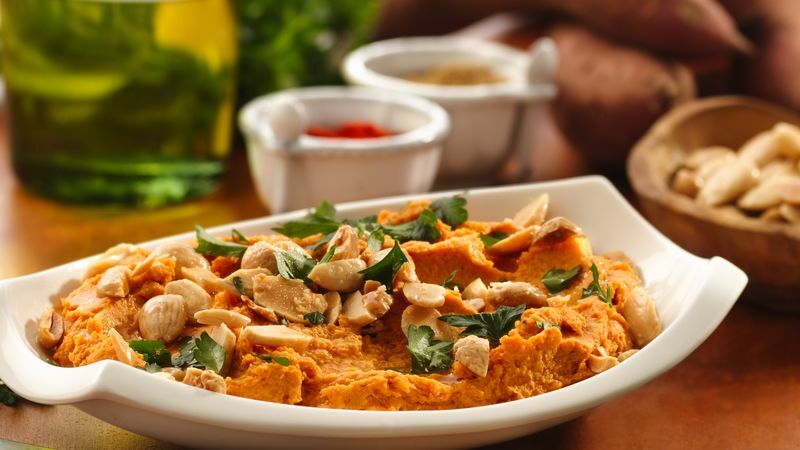 To make hummus, place cooked sweet potato and remaining hummus ingredients in large food processor. Cover; process until smooth. If needed, add water 1 tablespoon at a time to desired consistency. Cover and chill at least 2 hours to allow flavors to blend. To serve, spoon hummus onto serving platter. Top with almonds, parsley and 1 tablespoon olive oil. Serve with flatbread crackers and/or fresh veggies. You've got to love them! Sweet potatoes are naturally rich tasting and sweet, and they are a good source of vitamins A and C.